Glenelg High baseball coach Terry Coleman tried in 1993 to put his current player Brian Boteler's work ethic in perspective by referencing one of his players from a decade earlier, Greg Smith, according to The Baltimore Sun. "Not since we had Greg Smith," Coleman told The Sun, "has anyone worked as hard as Brian." Smith took that work ethic, working his way through the minor leagues and making the majors for parts of three seasons. Those parts, though, consisted of all of 27 big league games. Though he was still playing at AAA, by the time Coleman spoke to The Sun in 1993, it had already been two years since what ultimately became Smith's final major league appearance. 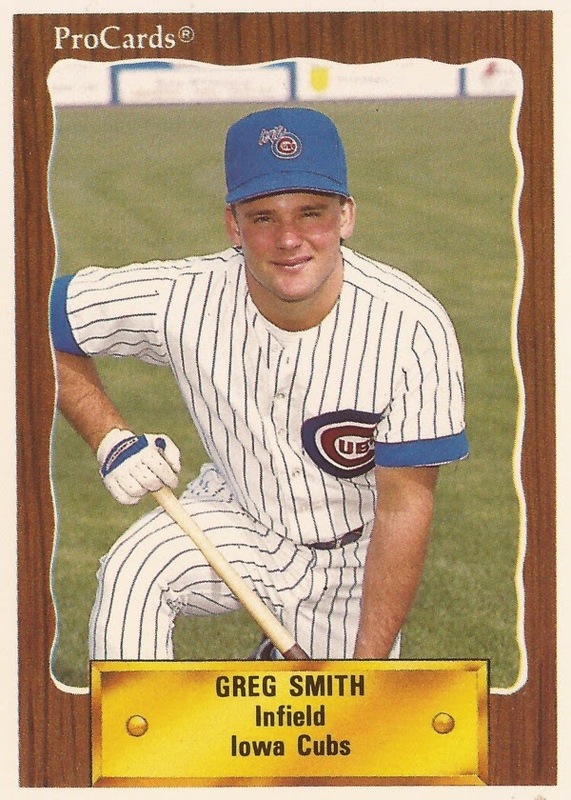 Smith's professional career began in 1985, taken by the Cubs in the second round of the draft, directly out of Glenelg High School in Maryland. Smith started that first season at rookie Wytheville, hitting .235 in 51 games. He moved to single-A Peoria in 1986, staying there for 1987. He hit .270 in his second campaign in Peoria, and .280 in 1988 at single-A Winston-Salem. At Winston-Salem, Smith, a switch-hitter, was called one of the bright spots on the team by The Chicago Tribune. In 1989, Smith made AA Charlotte. He hit .296 with five home runs. He also earned a September call-up to Chicago. Smith made Chicago after making the Southern League All-Star team. That May, Smith had two-straight three-hit games, getting noticed by his Charlotte manager Jim Essian, the manager noting to The Rock Hill Herald that Smith "is on fire." Called up Sept. 1, Smith found himself in the middle of the Cubs' 1989 pennant race. He also found himself getting into just four games. In five at bats, he got two hits and two RBIs. The two RBIs came Sept. 27 at Montreal, the game after the Cubs clinched. Smith returned to Chicago for 1990, starting with the team in April and not getting back until September. He got into 18 games, nine hits in 44 at bats. In September, Smith drove in three runs in one game, of his total of five on the season. Mainly a second baseman, Smith soon found himself being looked at by other teams. The Cubs already had a second baseman in Hall of Famer Ryne Sandberg. In May, the Yankees looked at him. In December, the Dodgers traded for him. "He is hard-nosed, he is a battler, he runs well," Dodgers VP Fred Claire told The Los Angeles Times after the trade, adding, "Everybody we talk to likes him a lot." Smith, though, only got into five games with the Dodgers in 1991, ending his big league career. The player sent to the Cubs in the deal, Jose Vizcaino, played through 2006. Smith continued playing through 1995. He played 1992 with the Tigers at AAA Toledo, 1993 back with the Cubs at AAA Iowa and then 1994 with the Brewers at AAA New Orleans. Smith finished out his 11-season career in 1995 with stops at the Brewers, Orioles and Reds' AAA clubs.